Consumer Reports is known for taking an anti-Apple stance occasionally. Late last year, the testing agency said the iPhone X was worse than Samsung’s Galaxy S8 and that the iPhone 8’s performance lagged behind the Galaxy S7. It has also criticized Macs and iPads in the past. 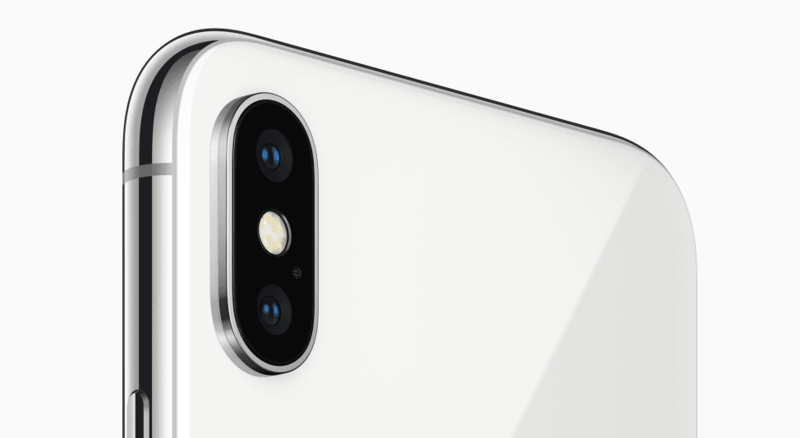 So, it came as a huge surprise when Consumer Reports updated its list of “Best Smartphone Cameras” and declared that the iPhone X has the world’s best smartphone camera. In fact, the top three positions were all occupied by Apple products. The iPhone X was followed by the iPhone 8 and iPhone 8 Plus. In Consumer Reports’ still photography tests that are designed to “evaluate resolution, dynamic range, color accuracy, and visual noise,” the iPhone X and iPhone 8 Plus performed the best. The smaller iPhone 8 was just behind its more expensive siblings. 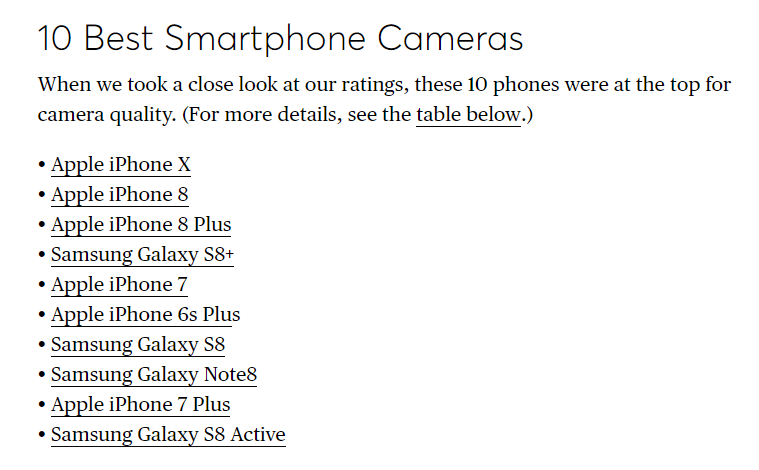 However, all three handsets obtained the “very good” ratings in still photography tests. The 2017 iPhones were immediately followed by Samsung’s Galaxy S8 Plus and the iPhone 7. Other Samsung devices in the list include the Galaxy S8, Galaxy Note 8, and Galaxy S8 Active. In video shooting tests, Consumer Reports found the iPhone X and iPhone 8 were “excellent” while the iPhone 8 Plus received “very good” ratings. Older iPhones such as the iPhone 6S Plus, iPhone 7, and iPhone 7 Plus all received “very good” ratings for still photography as well as video quality. The iPhone X camera has been praised by reviewers as well as consumers from across the globe. Camera testing firm DxOMark has given the anniversary iPhone a score of 97. Another review firm DPReview says the iPhone X camera delivers “extremely impressive” results. Though the iPhone X isn’t as good as DSLRs, it has significantly closed the gap between smartphone cameras and DSLRs. The iPhone X has two vertically-aligned 12-megapixel sensors on the back. One of them is a wide-angle lens with an f/1.8 aperture and the second one is a telephoto lens with an f/2.4 aperture. It also has optical image stabilization and a dedicated image signal processor. On the front, there is a TrueDepth camera that allows you to take selfies in Portrait Mode with blurred backgrounds. The device also has a new Portrait Lighting feature that adds different lighting effects to images. Consumer Reports’ list does not include Samsung’s newly launched Galaxy S9 and S9 Plus. These phones have the best camera of any Samsung smartphone. The Galaxy S9 and S9 Plus haven’t yet hit the store shelves, so real-life camera tests are still at least a couple of weeks away. The smaller Galaxy S9 has a single 12-megapixel lens on the back while the Galaxy S9 Plus sports two 12-megapixel sensors on the rear panel. The Galaxy S9 and S9 Plus have variable aperture lenses with apertures of f/2.4 and f/1.5. The camera switches between these two apertures automatically depending on the lighting conditions to deliver crisp and clear images. You can also change the apertures manually in Pro Mode. The f/1.5 aperture is particularly good in low-light conditions while the f/2.4 allows you to take great pictures in daylight conditions. Apple is planning to launch as many as three new iPhones later this year, reports Bloomberg. All of them will have an iPhone X-like bezel-less design with a top notch. The largest of them would have a giant 6.5-inch OLED display. The second one will retain the iPhone X’s 5.8-inch OLED screen. Both the OLED screen models will cost more than $1,000. The third model will have a 6.1-inch LCD screen to keep costs down. Though the LCD variant would have an iPhone X-like design, it would lack the 3D Touch functionality. It will likely be priced between $700 and $800. All the three upcoming iPhones would be powered by an upgraded A12 processor. According to KGI Securities analyst Ming-Chi Kuo, Apple will include Face ID technology in all the 2018 iPhones as well as the next-gen iPad Pro. The LCD version is rumored to feature 3GB RAM while its more expensive siblings would come with a higher 4GB RAM. Kuo claims the LCD model would be the most popular of them all due to its lower price. Though many Apple customers hate the iPhone X’s notch, Android vendors are rushing to copy the feature. Asus has launched the ZenFone 5 with a top notch borrowed from the iPhone X. Leaked images suggest that the upcoming OnePlus 6 will also have a notch to house the front camera, ear speaker, and other sensors. VentureBeat contributor Evan Blass has reported that Huawei’s upcoming P20, P20 Pro, and P20 Lite will have a notch similar to the iPhone X. However, the notch on Huawei’s P20 series appears to be smaller than the iPhone X.